The month of fasting, Ramadan, is often greeted by the Sufis as a good friend, and as a welcome and honoured guest. They love to see this guest come, but also to see him go. The implication of the first is clear, but perhaps not of the second. The end of the month of fasting is followed by a feast. In ordinary terms it means that you can eat and drink. In Sufi terms the feast implies the meeting with the Beloved. The Beloved is then the cupbearer Who pours out the wine of gnosis and love. Helal-e 'id-e khaasaan daur-e jaam ast. is the crescent of the feast. That is why a Chishti pir often said: "May every day be a day of festival to you!" 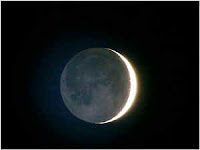 As the moon of Ramadan come to an end and the new moon appear on the horizon, it marks the islamic festival, Eid ul Fitr. Depending on geographic location, muslims around the world will be celebrating the Festival either on Tuesday (30th September) or Wednesday (1st October). The Shadhiliya sufi community, Naqshbandi-Haqqani community as well as others in USA will be observing on Tuesday this year. This festival celebrates the end of Ramadaz (or Ramzan), the Muslim month of fasting. It is an occasion of feasting and rejoicing. The first Eid was celebrated in 624 CE by the Prophet Muhammad with his companions and relatives over the completion a month of fasting. Significance Of Eid-ul Fitr: Eid is a Thanksgiving Day : Muslims assemble in a brotherly and joyful atmosphere to offer their gratitude to God for helping them to fulfil their spiritual obligations like fasting and alms giving to poors - prior to the Eid. Eid is a Day of Remembrance : The Muslims pray to God and glorify His name to demonstrate their remembrance of His favors. Eid is a Day of Victory : The devotee who succeeds in attaining his spiritual rights and growth receives the Eid with a victorious spirit. Eid is a Day of Harvest : God gives infinitely to those who are sincerely concerned with the general welfare of their fellow believers. Eid is a Day of Forgiveness : When Muslims assemble in the congregation of the Day, they whole-heartedly pray for forgiveness and strength in faith. And God has assured those who approach Him with sincerity of His mercy and forgiveness. Eid is a Day of Peace : When a Muslim establishes peace within his heart by obeying the Law of God and leading a disciplinary life, he has certainly concluded a most invioble treaty of peace with God. Allah is Greatest; Allah is Supreme! The message of Love, Peace, Mercy, and Justice." Broadcast of Eid Prayer: Naqshbandi-Haqqani site will broadcast Live the Eid Prayers led by Shaykh Hisham Kabbani in Michigan starting at about 8:30AM* (Tuesday) Detroit, Michigan Time*. The broadcast will begin before that with Takbirat starting anytime after 7:30AM. To watch visit: www.sufilive.com and click on the live broadcast link.